AX32 is your digital audio swiss knife and chameleon. It is your audio routing centerpiece, digital format converter, worldclass AD/DA converter and monitor controller. 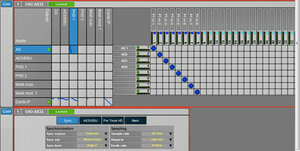 Quite simply, AX32 changes seamlessly between workflows in seconds, optimizing your production time and efficiency. 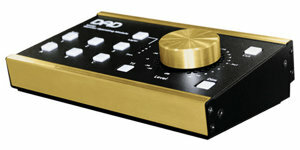 DX32 gives you the routing flexibility of the AX32 in a compact format. You can't expand the I/O section to the same extent, but with up to 384x384 audio channels matrix you can virtually create any workflow. 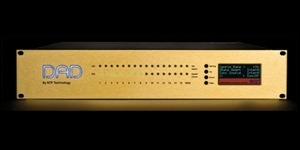 And if one is not enough, simply connect multiple units via Dante IP Audio. Complete monitor control is an essential part of an efficient workflow if your deliver in surround or 3D audio formats. Set up any monitoring workflow with AX32 or DX32 and add Pro|Mon license for dedicated monitoring features such as bass management, room correction and more. In a world that seem to be gradually moving towards working and mixing 'in the box', there are still situations where hands-on control is second to none. Monitor control is one of those cases. Enter MOM - our Monitor Operating Module. 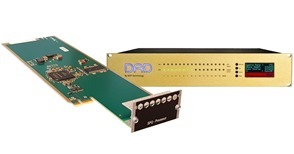 AX32 already comes with support for 64 channels of Dante IP Audio right out of the box, but in an effort to meet demand for an even higher channel count, our an optional expansion card adds another 128 channels to your digital audio-routing matrix.